The food was excellent, as usual for a meal from Uncle Steve, although dinner eventually devolved into an argument over politics and other nonsense – and things only got worse afterwards, when some miscommunication led to rather heated exchanges. It had me harking back to the Thanksgivings we had in Shanghai. Michael, Jarrett and Brad would all pitch in and create a massive feast for 15-20 of us, and the solidarity among expats celebrating far from home brought us all together as family. 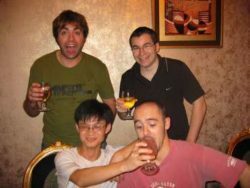 Those were some of the best times in China. Saturday I made time to get out to the golf course with Will and Piers, as they had been with Dad on Thanksgiving and I hadn’t seen them. The three of us carried our bags for nine holes and engaged in a little friendly competition, which saw Will finally clinch the Bory Cup for the second year in a row. Piers continues to improve at golf, only playing twice a year. If we manage to get him out there more next year, he’ll be ready for a shot at the Bory Cup, too. The weather was a little cold, but the sun poked through with enough regularity to keep us comfortable. Afterward, we shot the breeze with everybody in the Pro Shop for a while, then bid them farewell for the winter and headed to the train station, perfectly timed to meet my ride back home. One of Xianyi’s homemade meals was the perfect end to the day. i was up all night. godDAMNit.